Oh my word, do my boys ever love these. Don’t get me wrong, everyone in the family enjoys these frozen fruit cups, but my little guy, he squeals when he sees them on the counter and my oldest boy’s eyes light up when he hears they’re on the menu for dinner. I make a big batch (usually adding to the recipe to have a bigger stash in the freezer) and then it’s an easy family-favorite side dish I can add to a meal that needs a little something extra. This is a recipe that’s easy to adapt to your family’s fruits of choice. 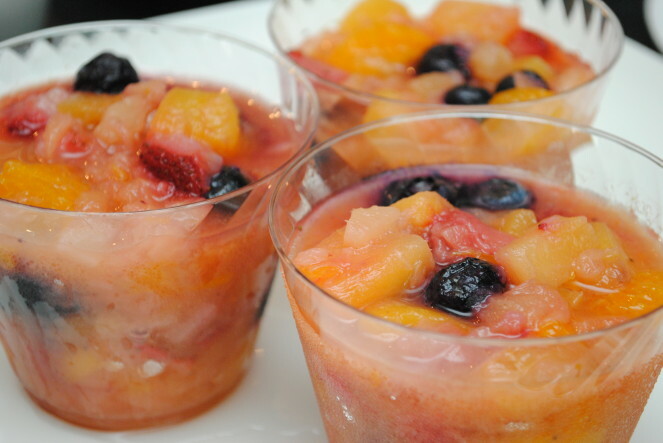 Shop the frozen fruit section at the grocery store or even add in some fresh fruit. Whatever you like most, use that. The original recipe calls for pineapple-orange juice concentrate, but I could never find it, so I’ve always used orange juice concentrate and we love it, but I’m sure other juices would be delicious too. Cut up peaches and mangoes into a small dice and place in a large bowl. Cut cherries in half and add to the bowl. Add in oranges and pineapple with the other fruit, then pour in orange juice concentrate. Stir well. Spoon fruit mixture into 9 oz plastic cups, about 2/3 full. Cover each cup individually with plastic wrap and place cups in freezer. On the day you want to serve them, place the number of fruit cups you need on the counter to thaw by mid-morning or so, and they should be perfect to eat by dinnertime. Remove plastic wrap and serve.